The engineering and technology group SENER has celebrated the inauguration of its facilities in Manchester, the Group’s base for its engineering and construction area in the United Kingdom, which have been fully operational since 2014. SENER uses Manchester as a base for working on projects, such as the ongoing construction of two Queen Elizabeth-class aircraft carriers for the Royal Navy, using the FORAN system, also employed in the Successor series of new nuclear submarines and the Type 26 frigates. Together with SENER’s activity in the aeronautics sector through individual transition plan (ITP), SENER performs other projects in the field of engineering and construction in the aerospace sector, in which works as a supplier for British companies. The company is also investigating potential contracts in power and process and in infrastructures and transport. In this latter sector, SENER has built up collaborative relationships with British universities and institutes of technology, such as the HR Wallingford research centre, with which it is delivering the new industrial port in Jorf Lasfar, Morocco. 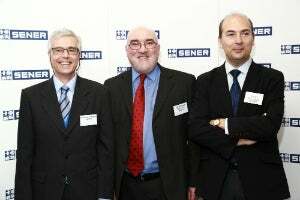 The SENER Group saw out 2014 with a turnover of £1 billion and a workforce of more than 5,500.